Travels and Trdelnik: Summer SUPER Foods!!! A number of weeks ago, I wrote a blog entry about some foods that have incredible affects on the body. Here are a few more specifically summer themed foods that one should load up on!! They have numerous AWESOME benefits for your body!! 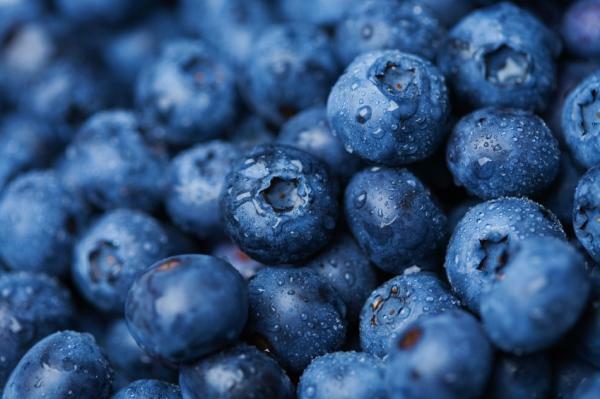 Blueberries are POWERFUL fruits. Their deep blue skins contain a stable of anti-agers that will keep you looking, thinking and even seeing like a spry young thing. Specifically they help to boost skins elasticity and connective tissue, and protect against UV damage. They have a nice dose of potassium inside which helps with the bodies circulation of nutrients and oxygen. They may even help reduce fact storage in your body!! Thanks to their ability to decrease insulin resistance. Blueberries either mixed in with yogurt or on top of some chocolate mousse have become one of my absolute FAVORITE things to eat, oh my gosh. I actively crave either of these snacks. SO yum. Tomatoes contain anti-cancer nutrients inside as well as nutrients that help defend the skin from sun damage which causes wrinkles, age lines and spots. 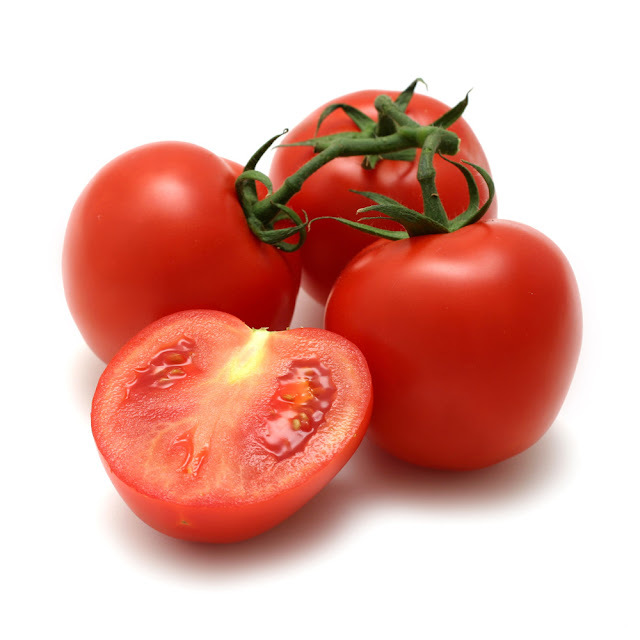 Eating tomatoes regularly concentrates this photoprotective benefit in skin. Tomatoes are also anti-inflammatory and high in potassium, to keep your electrolytes in balance for healthy circulation of nutrients. 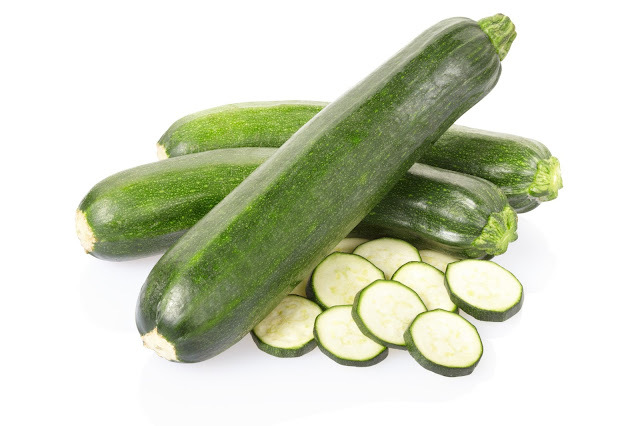 Not only is zucchini a seriously low calorie vegetable, but its fiber and detoxifying pectin make you feel full and block absorption of even more of its calories. But don't think the benefits of zucchini are bland. It offers a dose of anti-aging vitamins C and A, plus relaxing, blood-pressure lowering magnesium and potassium. You will also find nutrients like vitamin B and folate for healthy hair and riboflavin for collagen building in every bite. Zucchini is another food I have begun eating lots of lately. They are SO good in vegetable quesadillas or in omelets, oh man, tasty!! 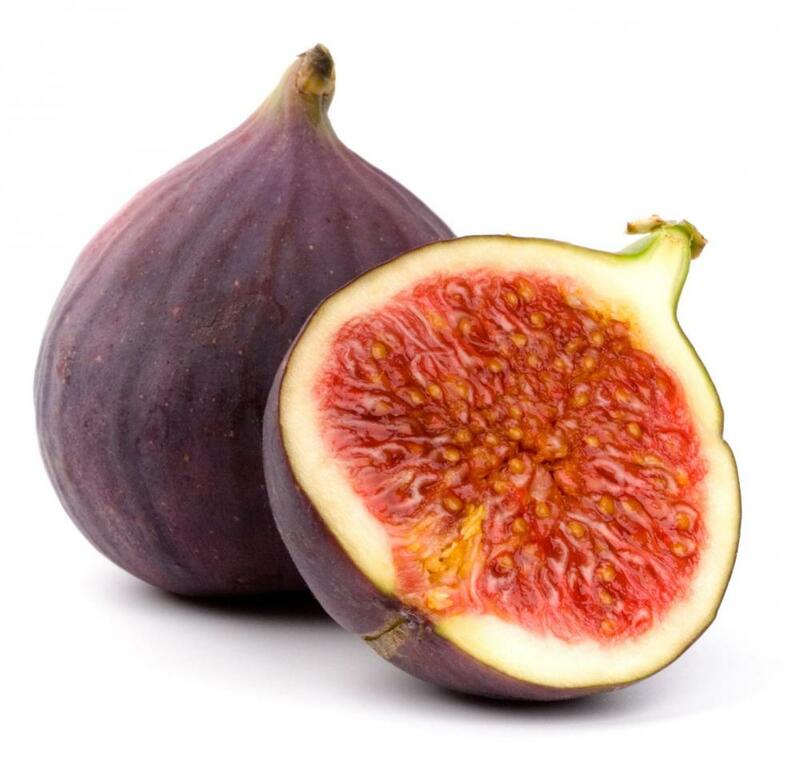 Figs contain amino acids that help boost blood flow to the skin and to other areas of the body. Fresh figs contain natural digestive enzymes that give your body a break, plus plenty of fiber (think of all those little seeds) that has a gentle laxative effect for easy elimination. They are rich in beauty minerals, especially manganese, calcium, potassium, and magnesium. Figs are also one of the rare fruits to contain anti-aging omega fatty acids in their seeds, and they help keep your pH balance in check. Peach! If you really want a peaches and cream complexion, fill up on this vitamin C and beta-carotene-rich fruit. You probably know by now that Vitamin C is one of the most powerful free-radical fighters and is essential for the manufacturing of healthy collagen to keep your complexion smooth and youthful. 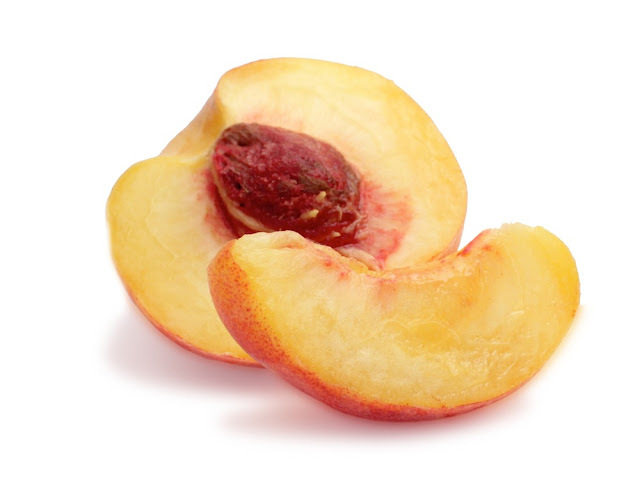 Peaches also help with regular cell repair and exfoliation. They also strengthen the cell membranes for healthy skin and scalp. Peaches help with cooling the body, as well as circulation, digestion and fluid retention, so they are a welcome snack in the summer heat. Hows that for a summer super food?? Peach coffee cake, anyone?? (That was the very first cake recipe I ever made, from scratch. Peach cake. And I was so surprised by how delicious it turned out!). Watermelon is a long, hydrating drink of water for your skin (its actually 92% water!). Watermelon gives your body strong UV-defense properties that work along with your sunscreen to help keep you sun damage free. 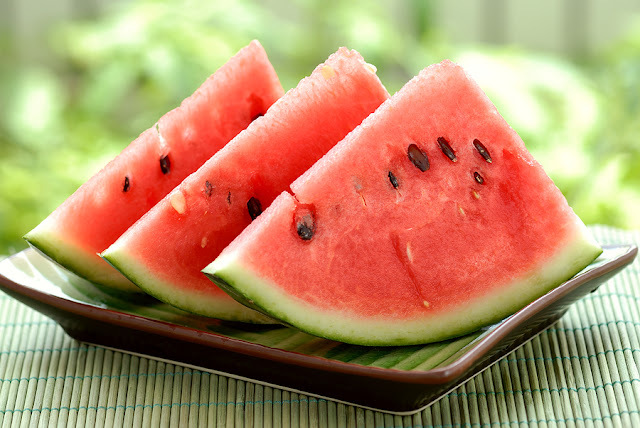 Watermelon reduces water retention, it cools and detoxifies the body. Its surprisingly a good source of iron, which is important for red blood cell production (which leads to healthy hair and radiant skin). It also helps the body make arginine, which is an amino acid that is indirectly involved in bodily heating and the production of anti-aging HGH. Watermelon also supports cardiovascular health, ensuring blood flow throughout the body. The quintessential summer picnic snack. Perfect. Peppers really pack a punch. Though of all peppers, red, yellow and orange have the most benefits. However all peppers support good circulation in the body. They are anti-inflammatory, chemo-protective, circulation-boosting and anti-aging. 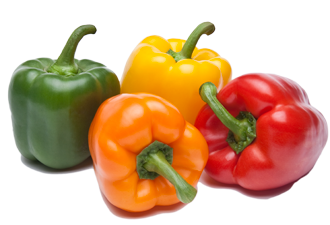 Peppers are high in collagen building vitamin C. Sweet bell peppers are also great sources of B vitamins for healthy hair and anti-aging beta-carotene for firm, elastic skin. 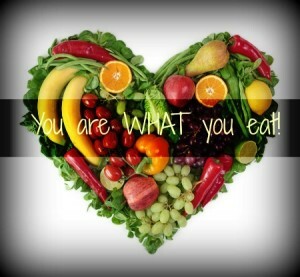 Eat them raw to keep their delicate antioxidants intact. I have recently become addiction to red peppers!!! I love to slice these into strips and just fill a plate with them and munch. The crunch, the slightly sweet taste, oh my gosh. Amazing. Red peppers are the bomb!